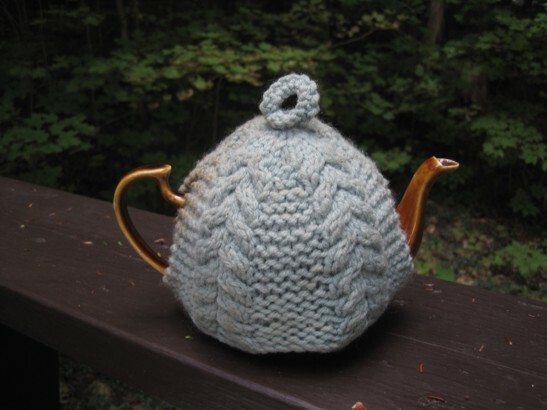 I don't know whether you remember my mentioning a visit to a cottage this summer where I saw a knitted tea cosy I was still thinking about afterward, but I got to go back to that cottage later and took a picture of it. I'm pretty sure this is an acrylic cosy and now that I look it at again it's pretty basic, isn't it - simple cables turned to face each other, with little garter buffers in between. It's not even a magnetic colour for a kitchen, though I do remember a fad for powder blue accessories back in the 80s. Apparently it was knit by a lady who also stays on the lake where this cottage sits, and I spotted another knit cosy in a drawer while I was putting away some spatulas I'd just dried. Yet I couldn't stop thinking about this cosy after I left from that first visit. In spite of all the other amazing things to see and remember about a cottage in the woods on the rocky shore of a peaceful lake! I wonder whether the attraction is the way this cosy encapsulates so much about a cottage - the drawing together of neighbours, the warmth of a fresh cup of tea shared with friends, the putting to use of whatever materials are to hand. Also I really love that pull thingy on top. Because the cosy is pinned on by the spout and handle it's not as obviously practical for tugging the thing off with, but my goodness, so cute!